A dull thud, then total silence. Then another rumble, but this time more intense. The sun is slowly setting, and a mist is rising over the surface of the river. The whole scene has a mystical air to it. And again, the thumping and rumbling sounds travel over the water to us, coming together now to create a more rhythmical pattern. 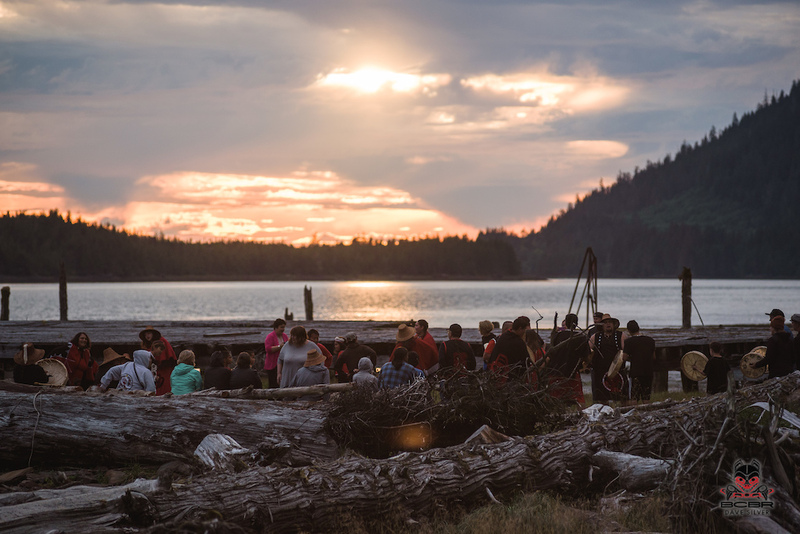 These are the traditional reverberations of the First Nations who have lived here in the far North of British Columbia, for thousands of years. 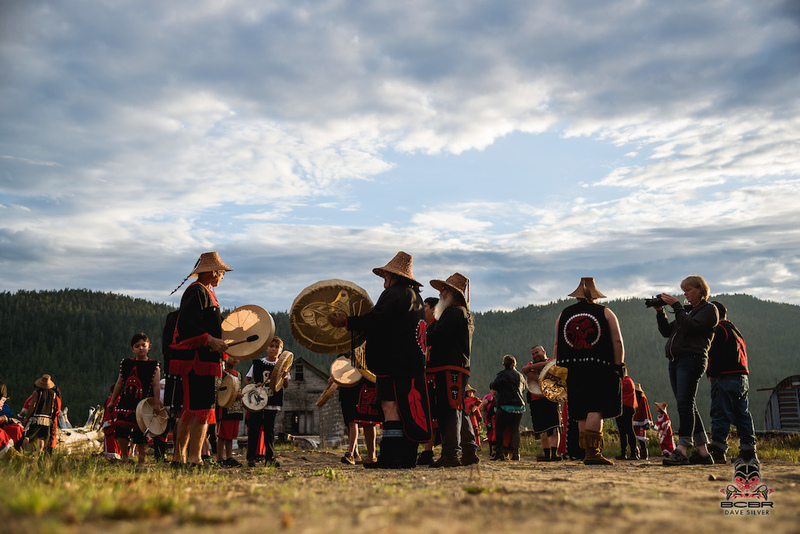 Dressed in their beautiful traditional clothing, they are dancing, singing, and drumming for us on this, the last night of our eight-day exploration of the best trails in the far North. The last few days have flown past in the company of a fantastic group of people from all four corners of the world. It feels like it was yesterday that I stepped off the plane, late at night, in Prince George. Tired, after a long trip, I go inside the airport and wait, but there’s no sign of my bike bag. 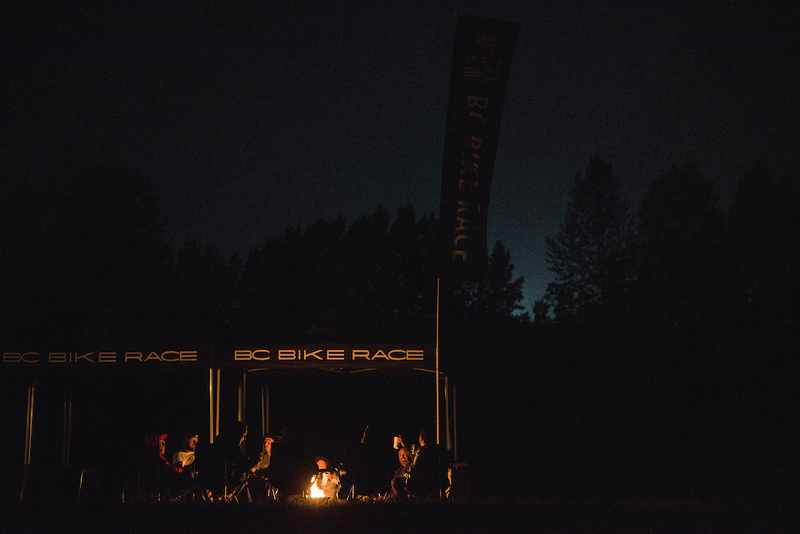 Justin, one of the guides with the BCBR crew greets me with a big smile when I finally make it out – I’m the last one. “I was starting to worry you weren’t going to show” he says, and I explain my predicament. But that isn’t a problem for Justin. “We’ll scoop up your bike tomorrow morning, on our way through to Burns Lake”. 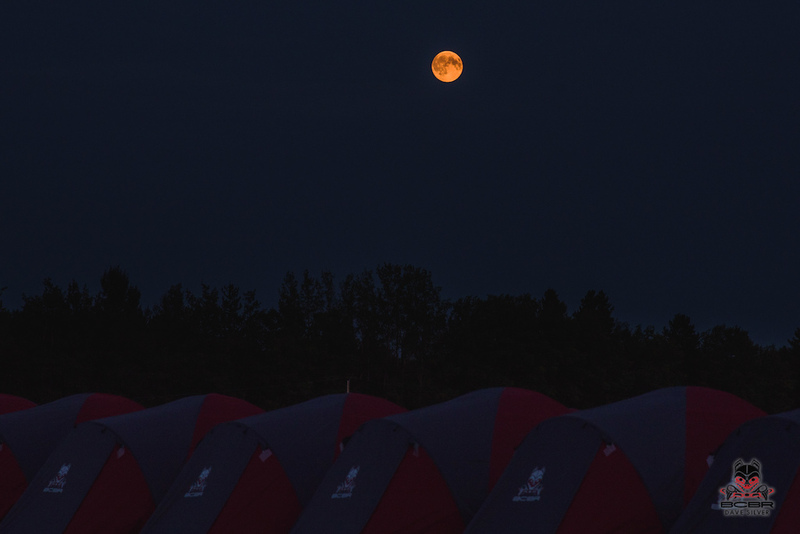 By the time we arrive at Vivian Lake, about an hour’s drive northwest of Prince George, all the other guests are already asleep in their tents. Only a couple of the crew are still awake, and they immediately press a cold beer into my hand. Boy, does that feel good after my thirty-hour trip from Valais (Switzerland) to Lichtenfels (Germany) and then from Frankfurt to Vancouver and onwards to Prince George. 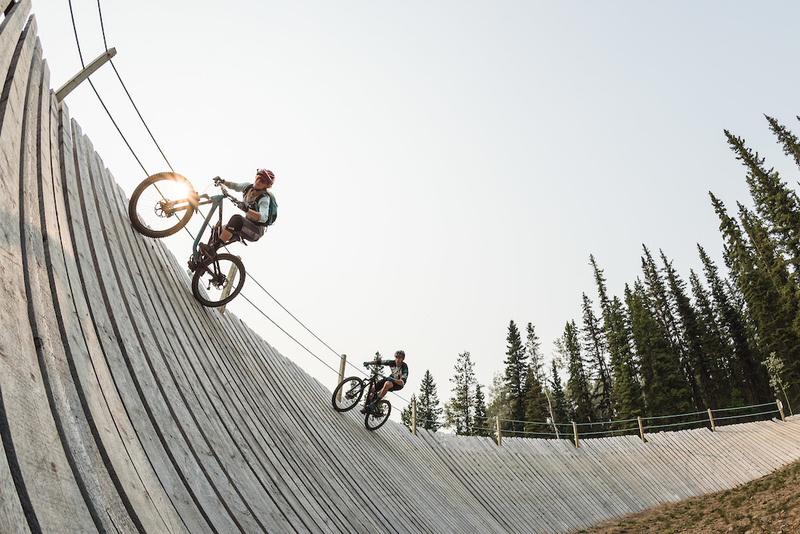 A photoshoot in Vallais meant that I missed the first two days of biking in North Vancouver and Prince George. But that didn’t matter, it was still definitely worth the long journey for the remaining six days. The next morning, I’m torn from my dreams by the screech of a rooster dog toy and a man’s deep voice calls us to breakfast. As I crawl out of my sleeping bag, I can see the sun shining through the green trees. I’ve barely stepped out of the tent when I’m greeted cheerily by the first few group members. “Oh, so you’re the new arrival. They told us there was another girl joining us”. I later found out that this was his own brand of coffee. 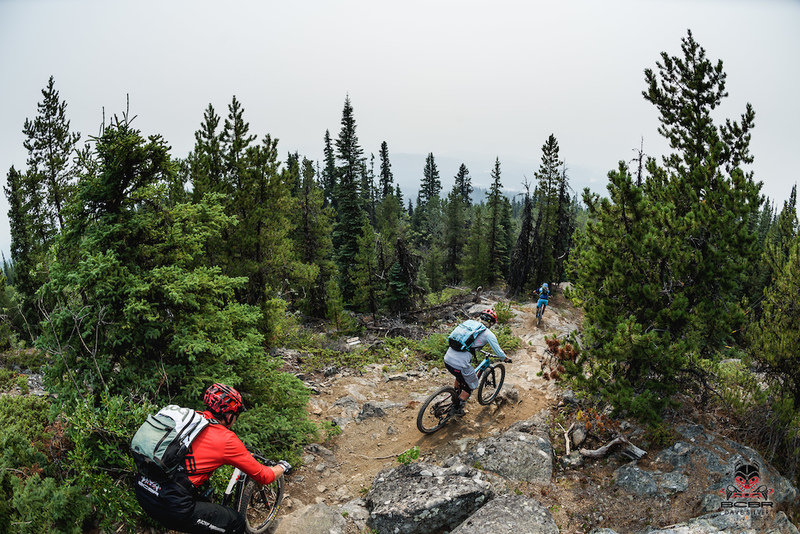 Not only is he a paramedic and bike guide, but he and his wife also have a coffee-roasting business in Terrace. After breakfast, we pack up our things and put our bags in the huge truck. 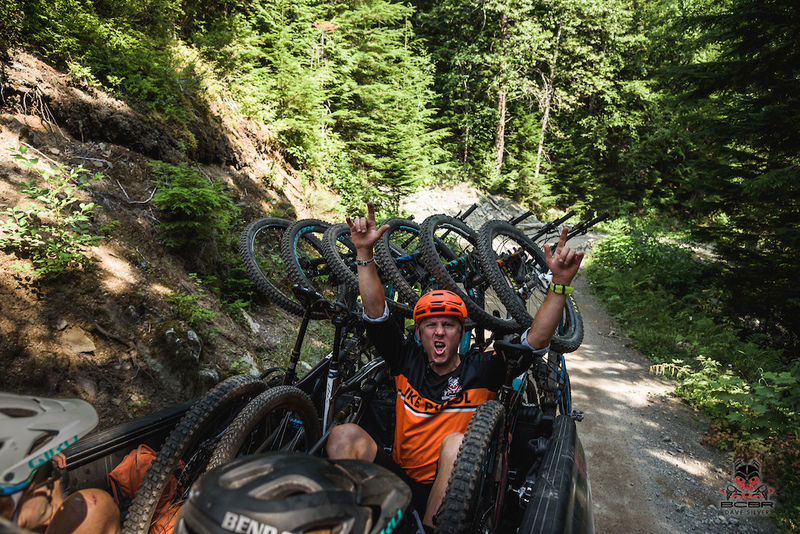 Today, we’re driving to Burns Lake and need to set off early so we have as much time as possible on the trails. One of the guides, Thomas, with the biggest pick-up truck I’ve ever seen, drives me to the airport to collect my bike. “Hallo ich bin Thomas”, he says in German, without even the slightest hint of an English accent. Taken aback, I look at him and he laughs. He emigrated from Germany thirty years ago and moved to Williams Lake. All he had was a plan; an idea. With the support of the local government, he set about building an indigenous-style village. 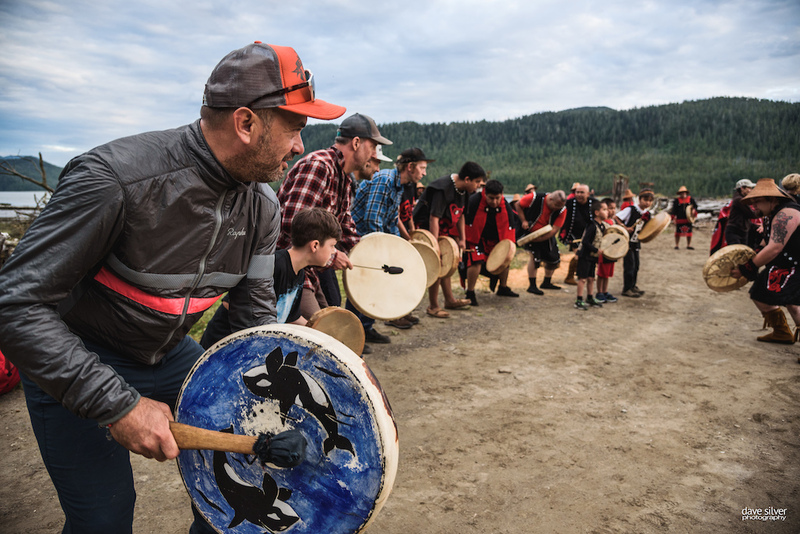 Then, one thing led to another, and today he has one of the biggest trail building companies in Northern British Columbia and his entire trail workforce is First Nations. I’m really excited by Thomas’ truck and tentatively ask if I might be allowed to drive it sometime. He laughs, and from that moment on, I’m his chauffeur; delighted to be driving this truck along the roads of the far North. Thomas and Patrick have plenty of fantastic stories to tell! 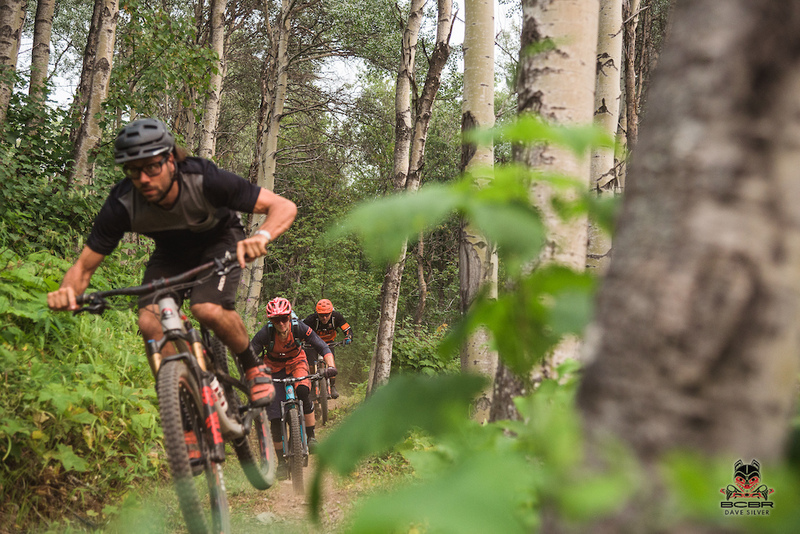 Darren and his wife Kelli are the two owners of the guiding company “Endless Biking"
When we arrive at Burns Lake, I assemble my bike, and the head guide Darren Butler tells us about the trails and the guided groups. There is something for everyone in our group of 50 people. 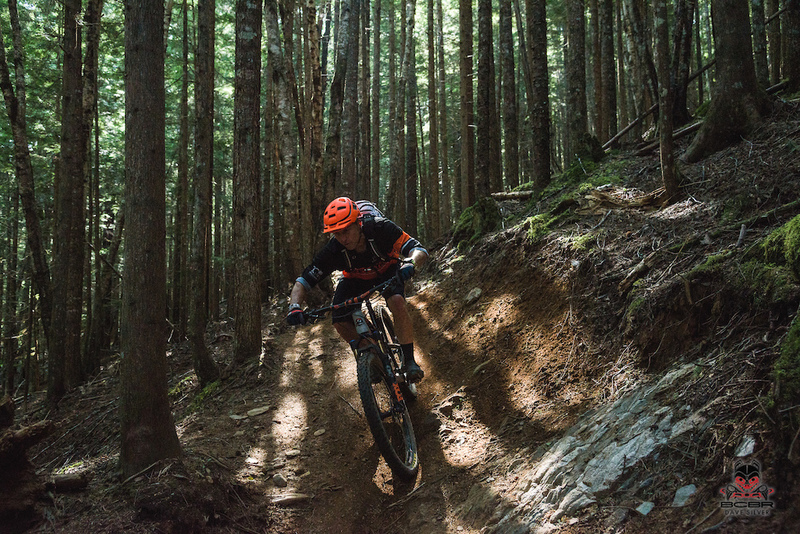 Anyone looking for long uphills and long downhills – all on trails, of course – should go with Justin. He’s all about the distance. Phew! I joined this group one day, and that night I slept particularly well. 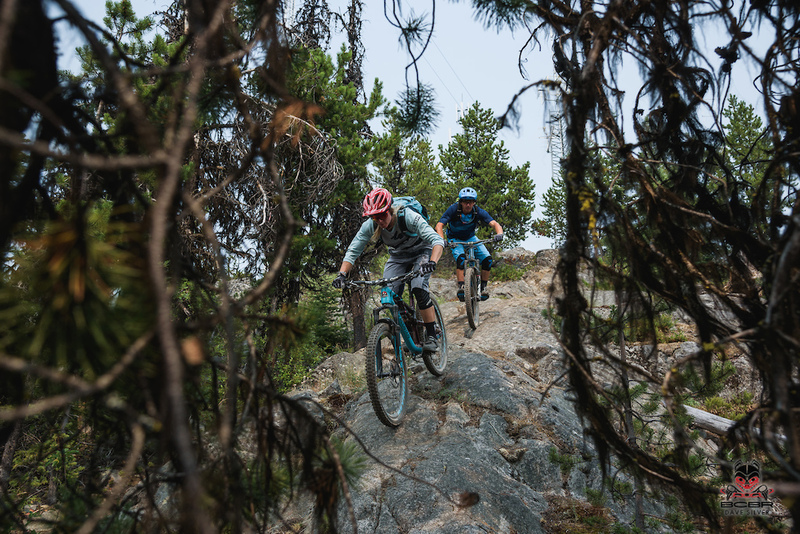 Kelli and Darren, the two owners of the guiding company “Endless Biking”, take on the Enduro faction. Since the majority of the guests opt for this group, marketing man Dre, Dean the company president, and Fletcher the medic, also join our group and each one guides a smaller contingent. Because it’s my first time biking here on the trails, I opt for a guided tour. I must have misheard Justin telling us that there would be long, technical uphills to tackle and that we’d have to ride fast to get back from this circuit in good time. So, I end up starting the ride with a pulse rate of 200 and immediately take a little nosedive on a technical uphill lefthander, right in front of Dre and others in the group. The incident gave us plenty to laugh about for the rest of the week! Dre is leading the train! Lots of technical uphill and downhills. After lots of technical uphill and downhill, endless berms, and little jumps, we get back to the lakeside start point and everything’s already set up for us. Eryn has set up her massage tent. 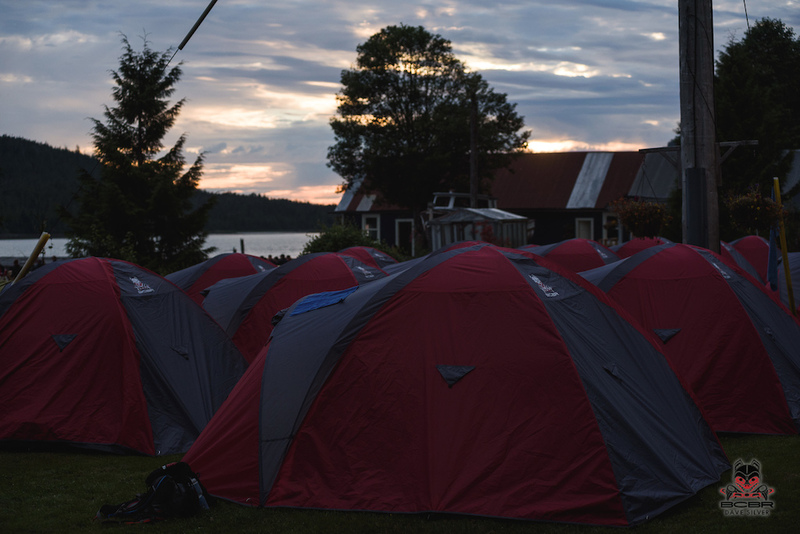 In one corner, our tents are all pitched in little groups. 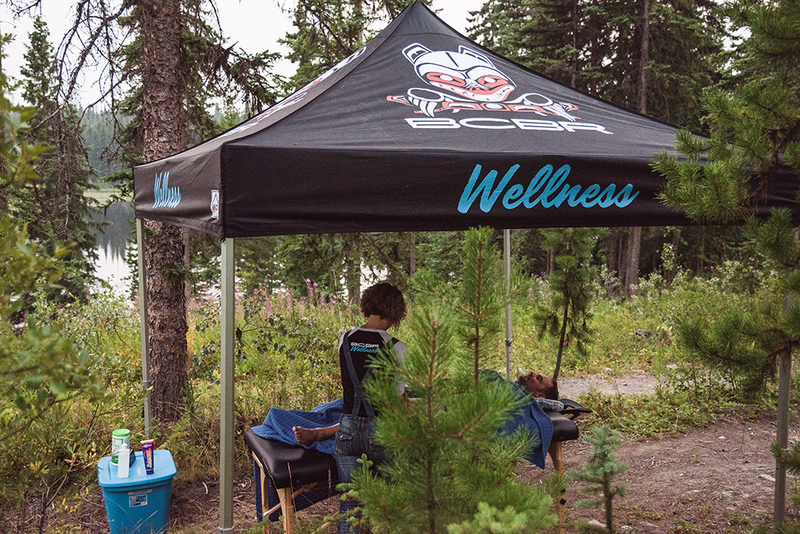 Down by the lake, Eryn Price, the Massage Therapist and Yoga instructor, has set up her massage tent where she is already treating her first patients, and the yoga mats are laid out on the jetty, ready for our evening and morning sessions. Morning and evening Yoga session with Eryn. Fraser Newton, the mechanic, is already hard at work in his workshop tent, kitted out with all the tools you could hope for, and right next to that, what else, but a big tub of beers on ice. 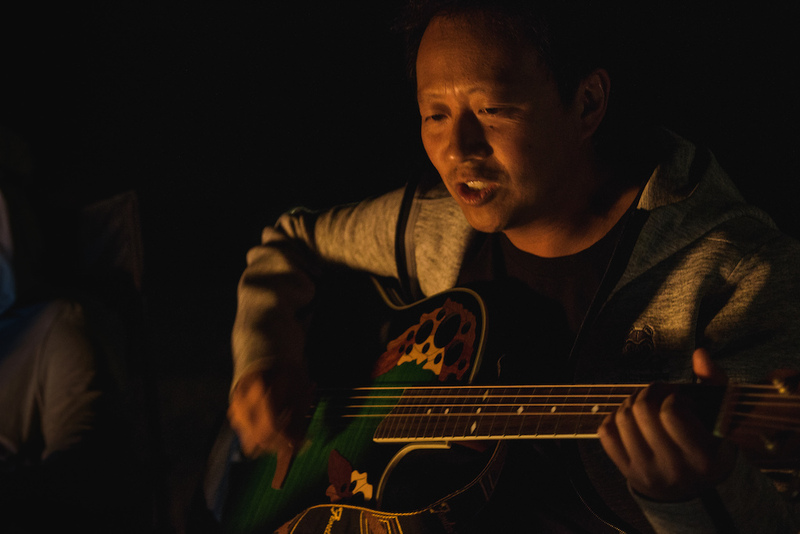 We spend the evening sitting on sandbags around the electric campfire, listening to Jimmy Au – shuttle driver and natural entertainer play guitar or sharing our stories. [PI=16552653 nopbcaption]Fraser works till late at night getting our bikes in shape for the next day. Tired from the long ride and still suffering from jet lag, I fall into my tent and listen to the laughter coming from the workshop tent. Fraser works till late at night getting our bikes in shape for the next day and is clearly enjoying it. 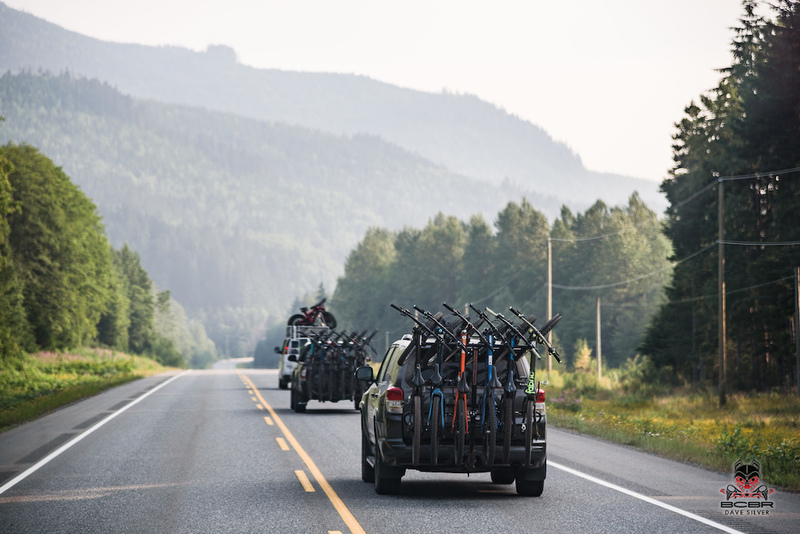 After a huge breakfast, cooked for us by a local First Nations catering company, we load our bikes up onto the roofs of the trucks. Today, I decide to join the boys on the North Shore shuttle. 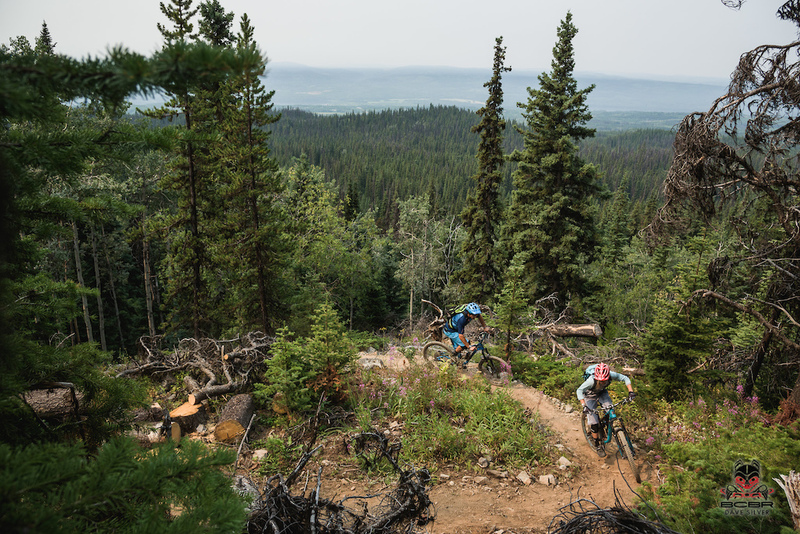 The North Shore trails in Burns Lake are not just technical downhills, they are super-technical, fast, free-flow trails. So, we keep hitting the steepest of the steeps; trails with names like ‘Shawn’s Flow’, ‘Full Boar’, ‘When Pigs Fly’ and ‘Smells like Bacon’. But the network of trails here is even bigger still. Aside from eleven black and double black diamonds, there are twenty blues and ten greens covering all abilities. There are twenty blue lines and ten greens covering all abilities. 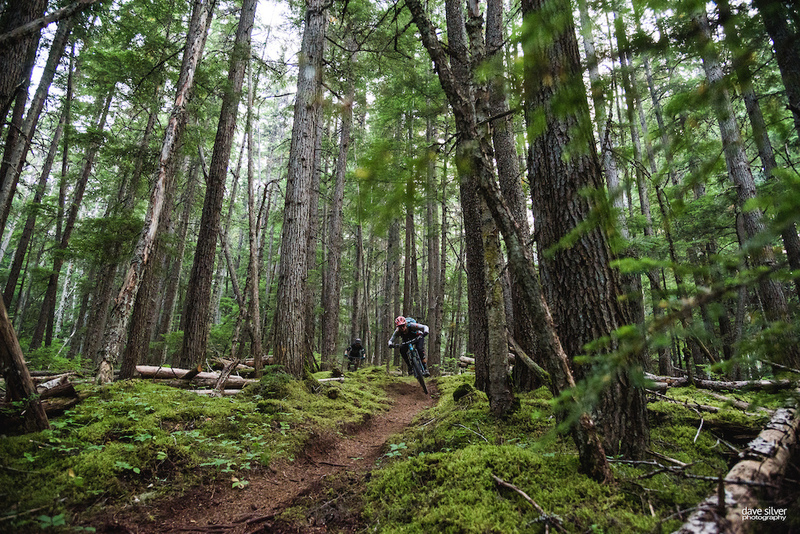 We ride right until the sun disappears behind the trees, trail after trail, each one more fun than the last. After the ride we cool off with a jump in the lake and a beer. 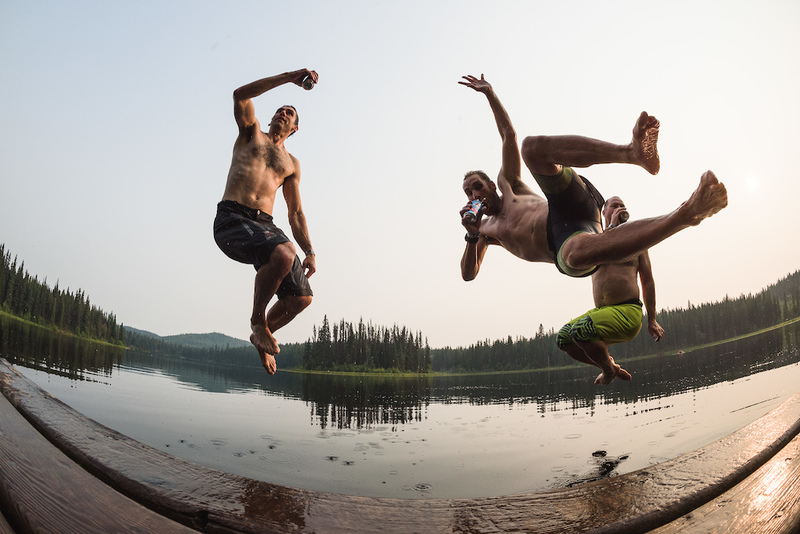 That night, we cool off with a jump in the lake and a beer. 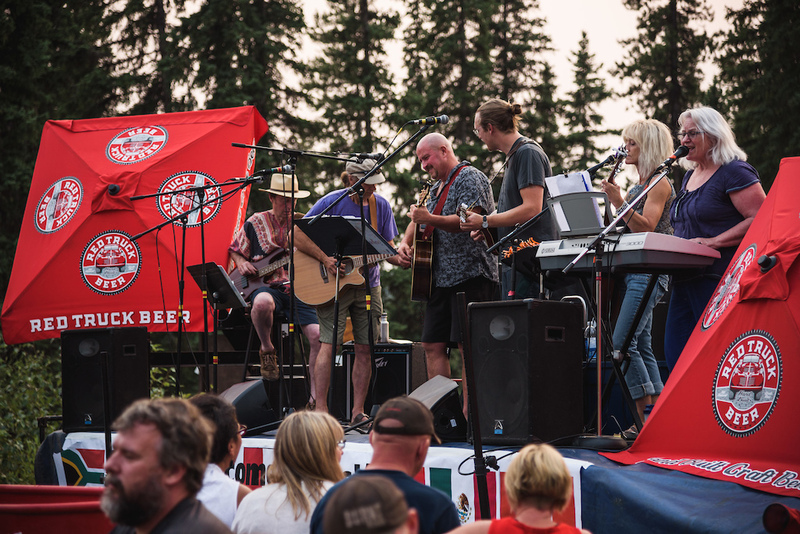 I had heard rumors, but I didn't really expect the people of Burns Lake to build a big stage and put on two bands for us that night. ...and put on two bands for us that night. I gnaw on my corn-on-the-cob and happily listen to the voice of the lead singer. I could have spent many more days there, but it was time to hit the road again. 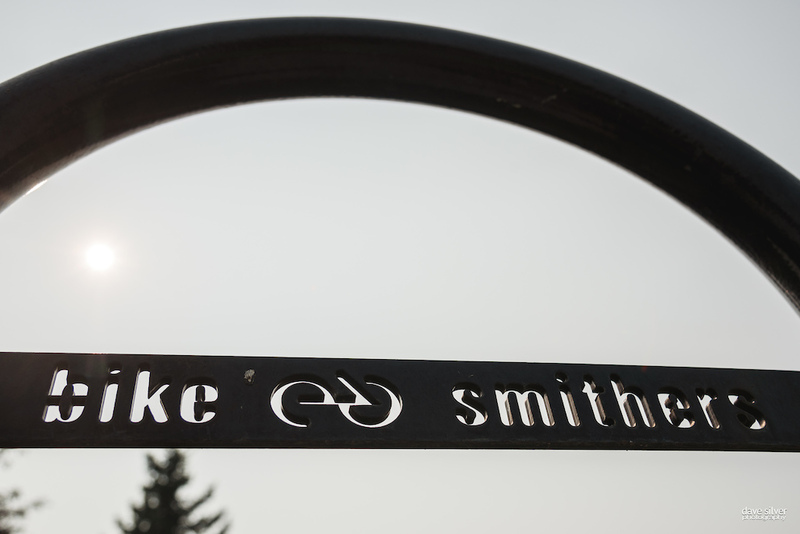 Today, we were heading to Smithers. 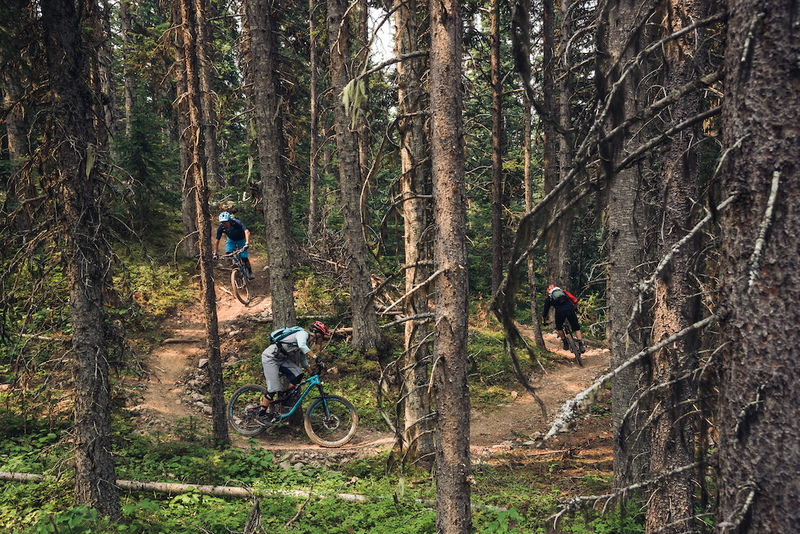 I’d heard lots of good things about the trails in Smithers, all of which I am happy to report are true. The small town is in the Bulkley River valley, just 250 km short of the border with Alaska, and was established in 1913 as the regional hub for the Grand Truck Pacific Railway. 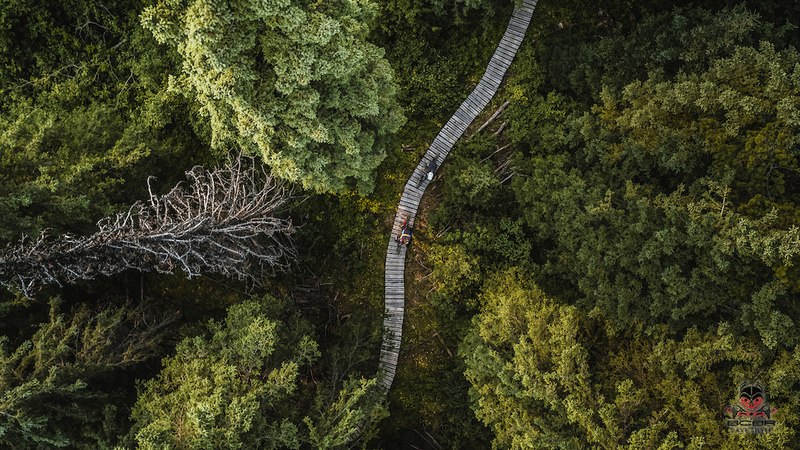 In the past, the main income for people was from forestry and mining, but today it’s from tourism, with travelers passing to and from Alaska. 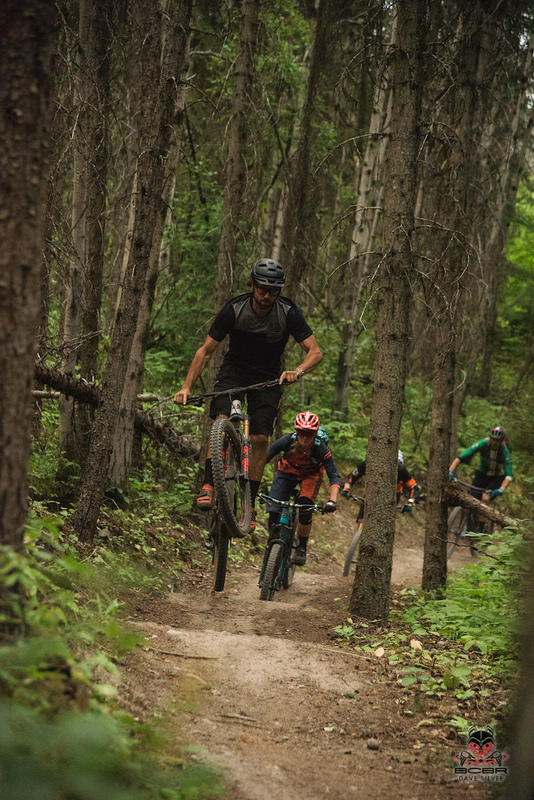 But the mountain biking scene up here is also growing in popularity. 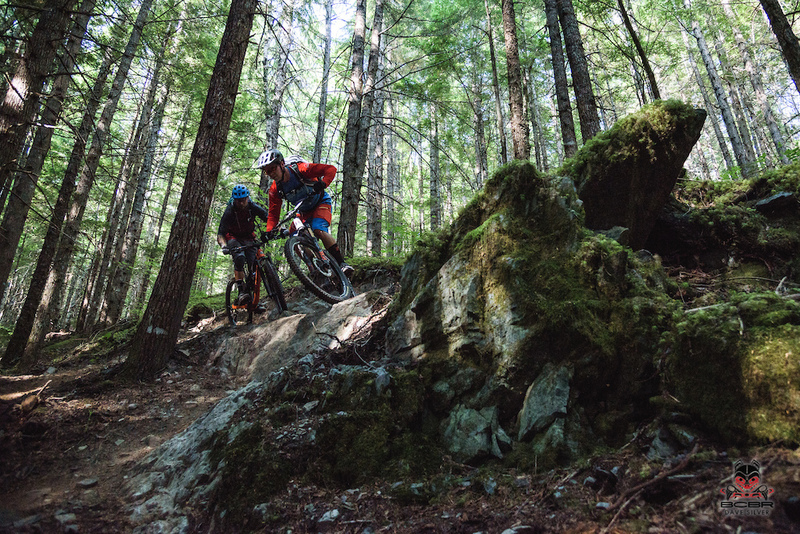 There are already four big trail parks and that looks set to increase. 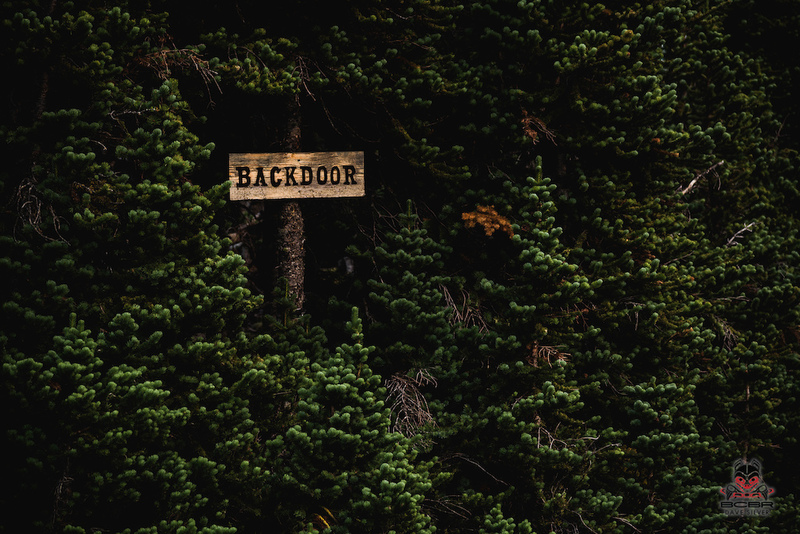 My favorite trail out here in Smithers, “Backdoor"
My favorite is the Backdoor Trail. 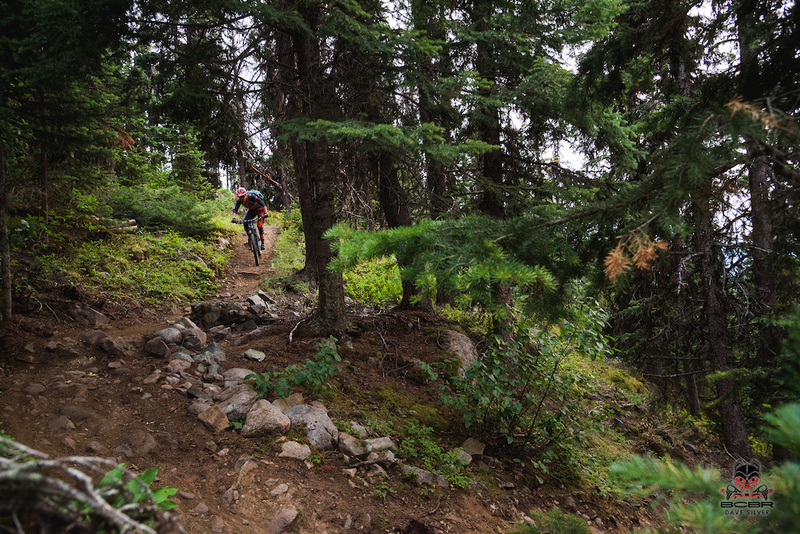 It’s got everything that I love about mountain biking. The atmosphere in the shuttle is great. This time, we’re an unusually big group, so we have three guides with us. We have to climb a little ramp and then it’s straight into singletrack downhill. The trail gets more technical the further we get. Just like a computer game, when you get to the next level. 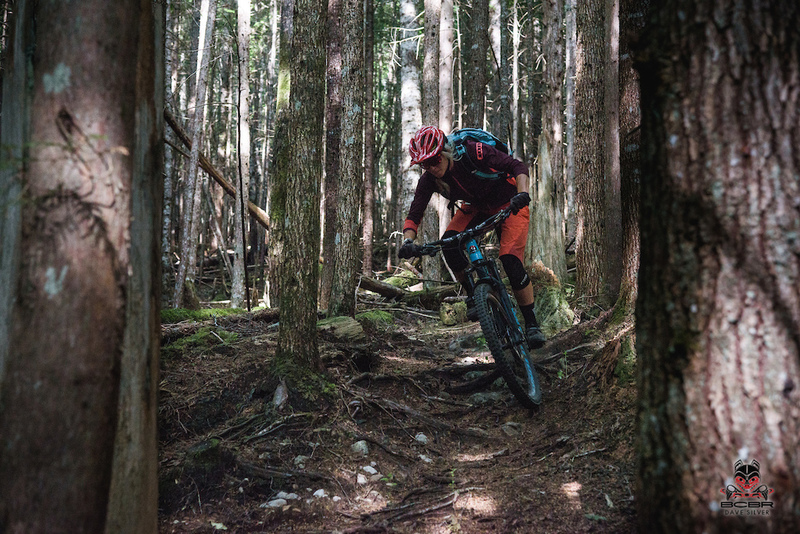 Plenty of roots and tight berms adorn the trail that runs through dense woodland and over open marshland. We go faster and faster. Fraser’s in front of me, hitting one jump after the next like a kangaroo and whooping with joy. The ground is soft and a little damp, our tires bore down deep into the dirt. The trail builders have included a couple of narrow wooden boardwalks in a few sections, to negotiate the marshland. 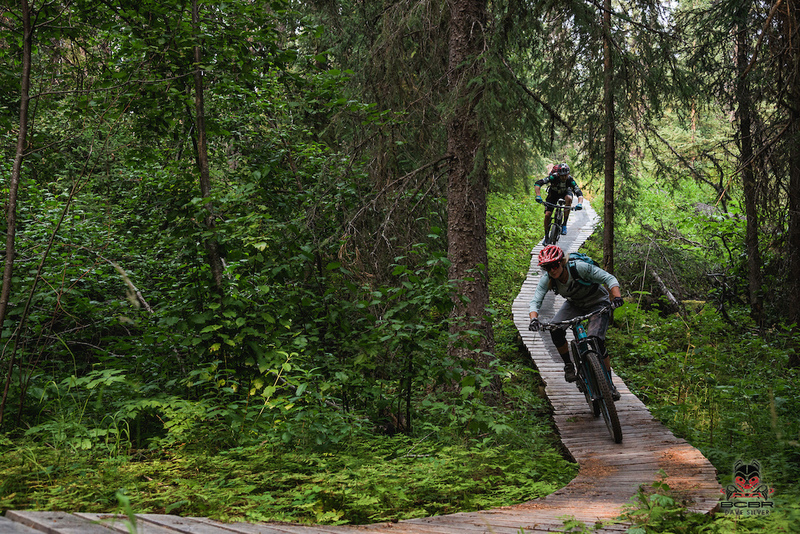 The trail builders have included a couple of narrow wooden boardwalks. 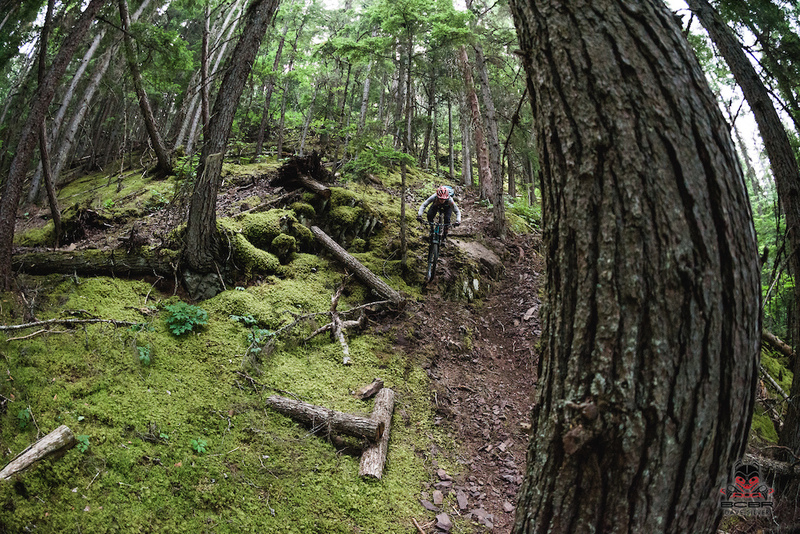 ...and tight berms adorn the trail. The trail gets more technical the further we get. Just like a computer game, where when you get to the next level, each section winds its way down until we’re spat out again on a street in the residential area. Drunk on stoke, we roll back to camp. And I promise myself then, that I will ride that same trail again the next day. 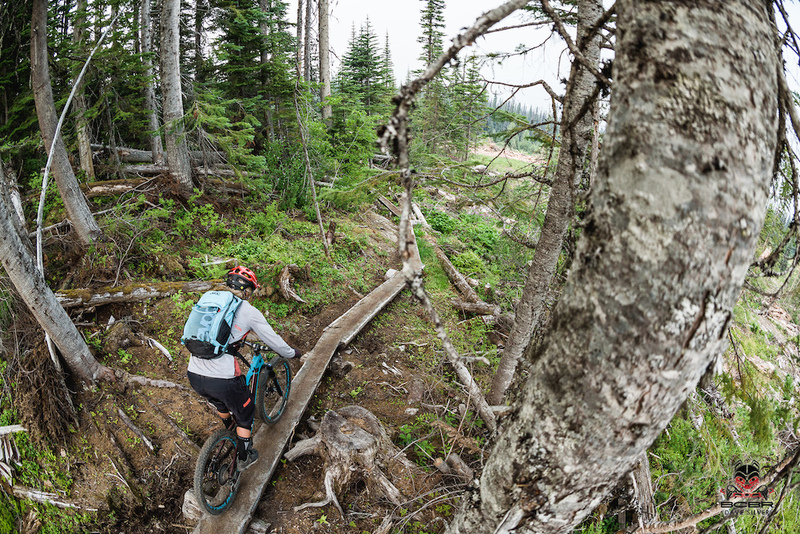 Today, there’s only time for a short ride on the shorter tracks here in Smithers. Today, there’s only time for a short ride, because we’re moving on. 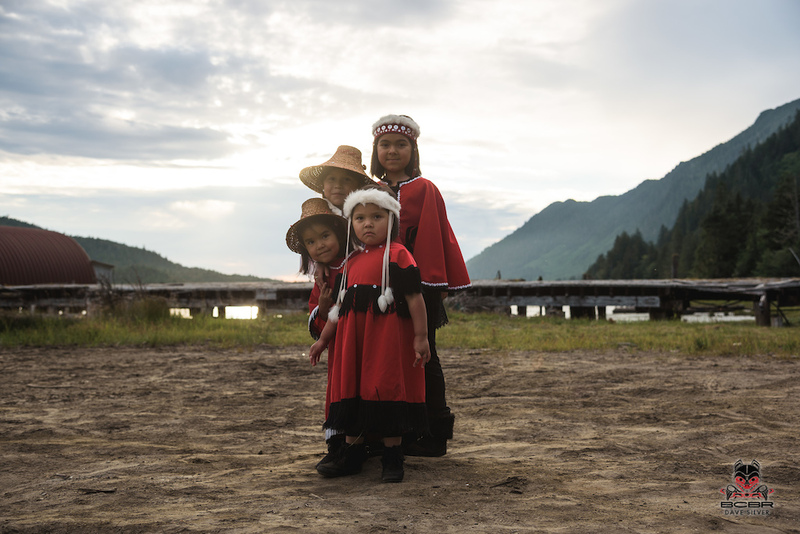 Alongside Prince Rupert, Terrace is one of the most important economic centers in Canada’s sparsely populated North. 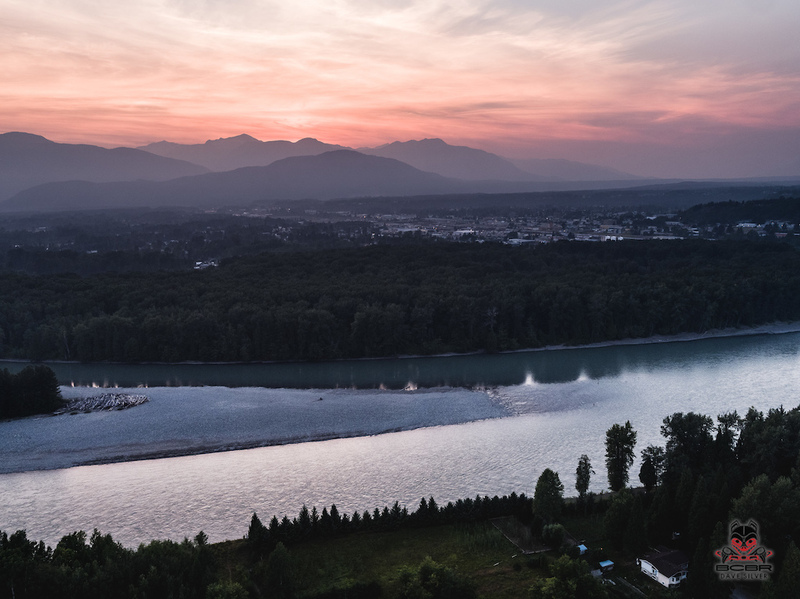 The city lies to the West of the Hazelton Mountains on the banks of the Skeena River and has a temperate rainforest climate. The forests here are much darker and damper. The gnarled red trunks of the Western Red Cedars loom like giants and their dense needles let hardly any sunlight through. This morning at the Terrace Mountain trail network there is no shuttle. 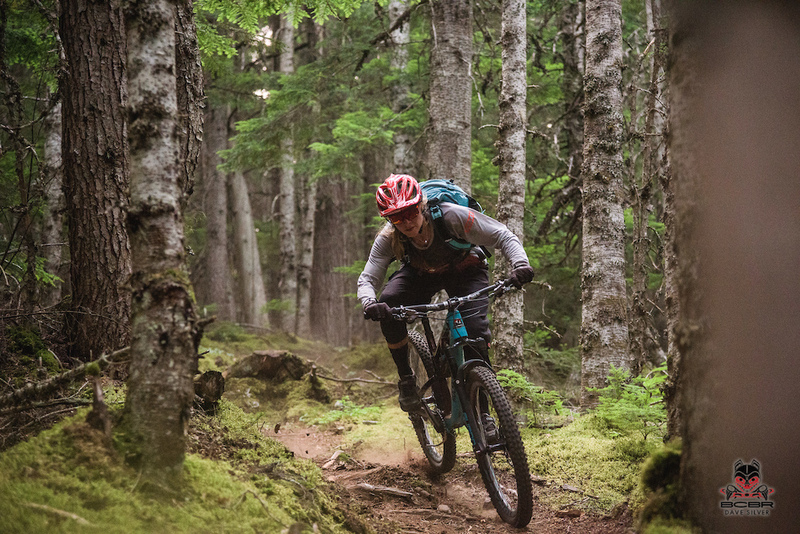 We ride a big circuit through the dense woods, with bright green moss lining the trail and wet tree roots that keep spitting my tires off to the left and right. 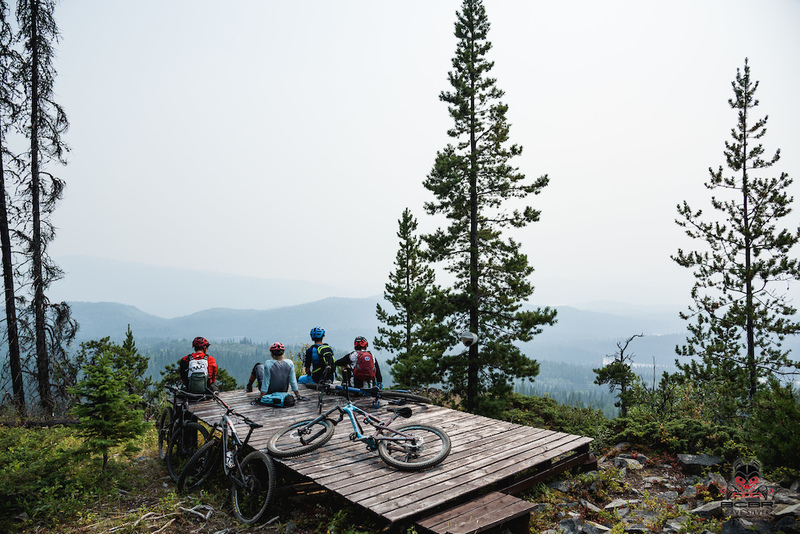 This morning at the Terrace Mountain trail network we ride a big circuit. Fully focused, I sprint up the short technical sections and balance along a narrow plank before dropping in again. Several hours later, sweated through, we arrive back at our lunch stop, and decide to explore the trails in the second network on the other side of the Skeena River. Our last few runs of the trip are in the Copper Mountain network. 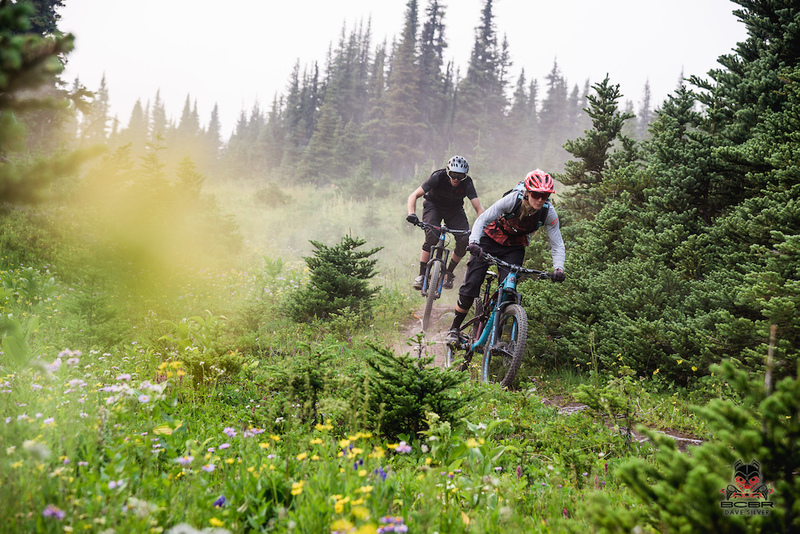 Our last few runs of the trip are ‘Your Mom’ and ‘Big Easy’ in the Copper Mountain network. 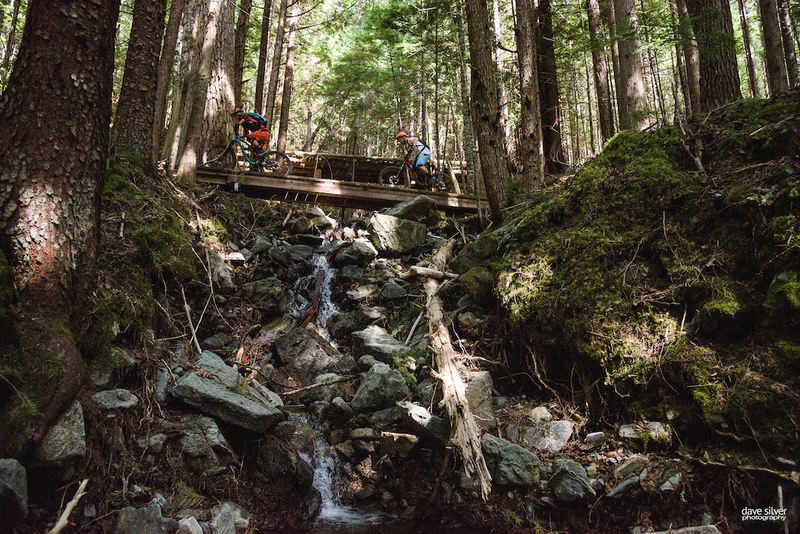 Yet again, this is a trail-building masterpiece. 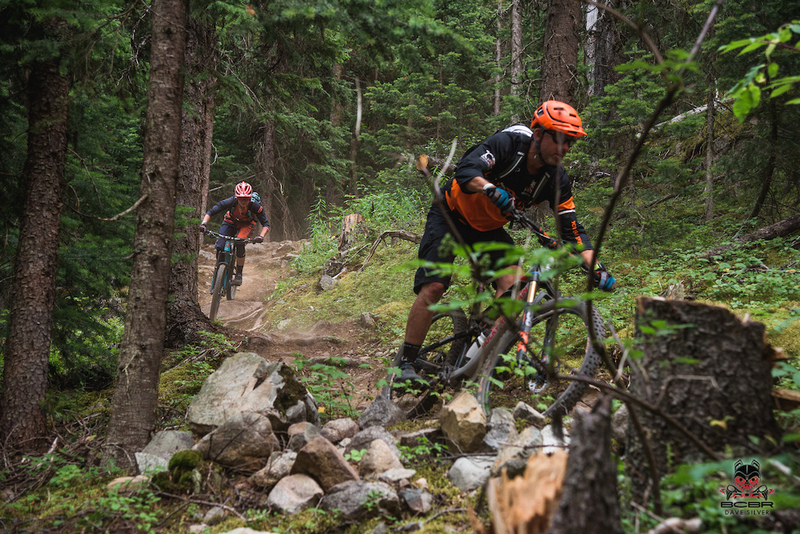 A mix of tight turns, berms, technical ascents and steep downhills. A little jump here, and then a flow section through a few bends. 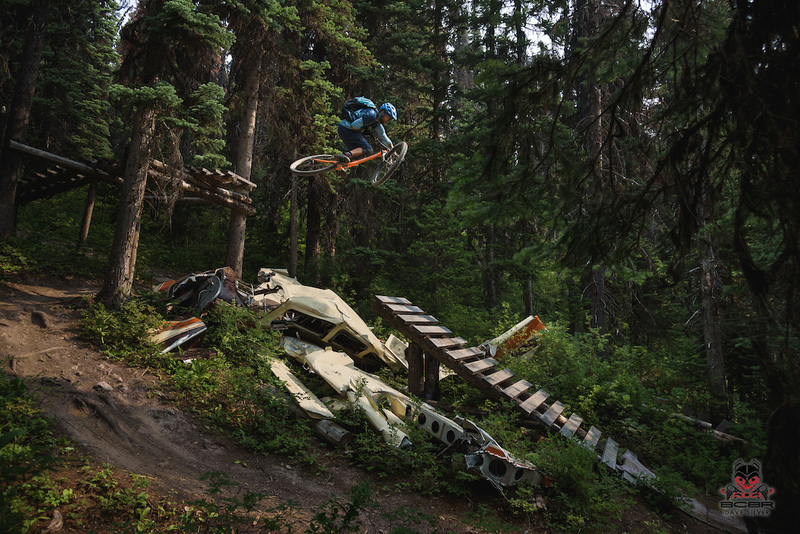 We well and truly fly down the trails, and again, the day is over way too fast. Sitting on the shuttle bus to Prince Rupert, gazing dreamily out the window, I can hardly believe that the trip is coming to an end tomorrow. And I have a feeling that’s just what the others around me are thinking too. The atmosphere is of quiet contentment instead of the usual excited chat. 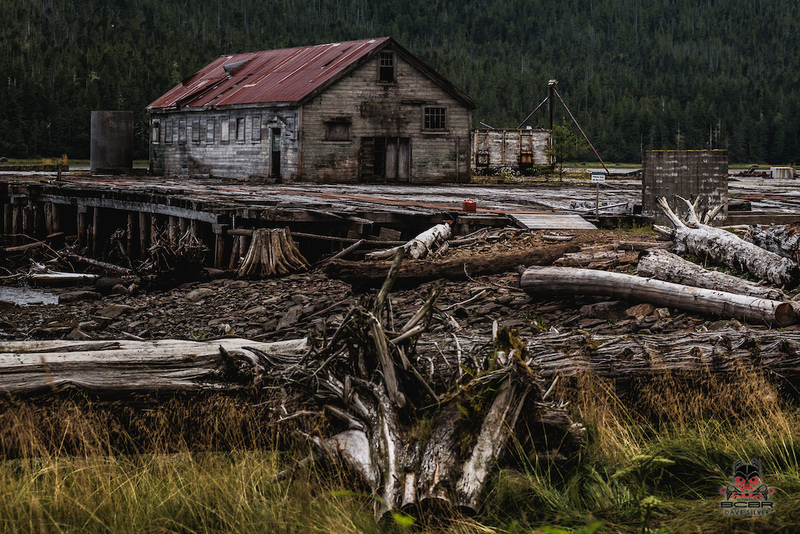 The sun is already low by the time we arrive at the old salmon cannery, not far from Prince Rupert. 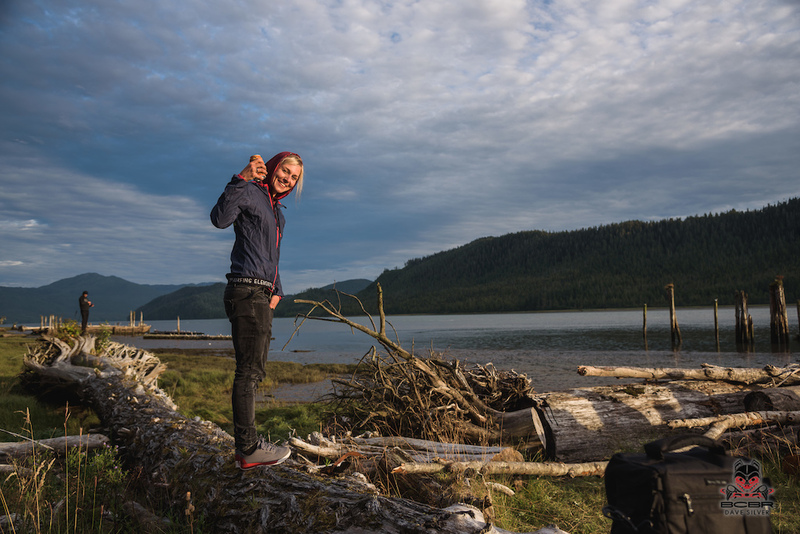 The Cassiar Cannery was bought by Eryn’s sister and brother-in-law in a rundown state, and over the years, they’ve lovingly converted it into a guesthouse with self-catering holiday cabins. They offer jetboating, sea kayaking trips, and fishing. The sun is already low by the time we arrive at the old salmon cannery. 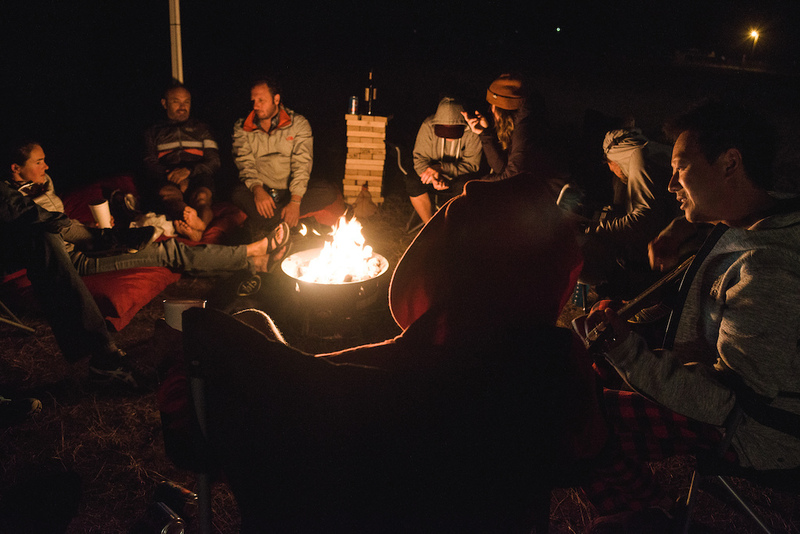 The BBQ is already going, and on the riverbank, there is a real campfire blazing. We arrive to a big party. The BBQ is already going, and on the riverbank, there is a real campfire blazing (no risk of starting a forest fire here). The beer is chilled, and the First Nations people are dancing and drumming around us and we’re dancing with them. As I retreat into my sleeping bag, the sound of the drumming, clapping, and humming subsides and blends in with the crackle of the campfire. I dream about the past few days, of the fantastic people I’ve met, the laughter, and the incredible trails. We had such a good time, all of us. 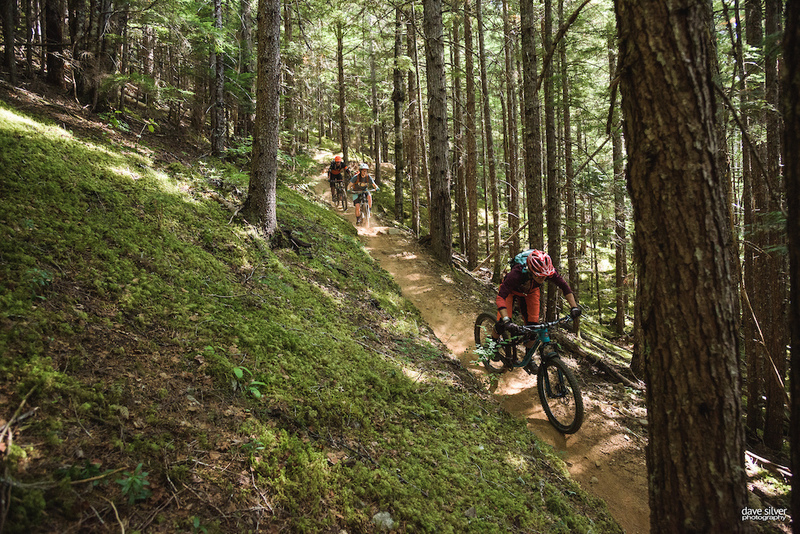 From 75-year-old Richard, who rode the easier cross-country trails with his wife in the mornings, to Liv, the woman with the pacemaker riding her E-bike. 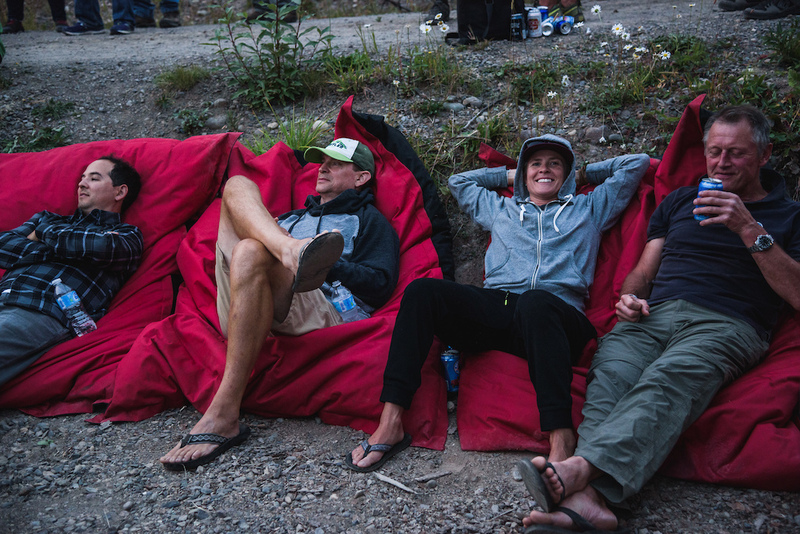 Or Adam, the EWS (Enduro World Series) athlete who, together with Gian made the Black Diamond Trails look lame. 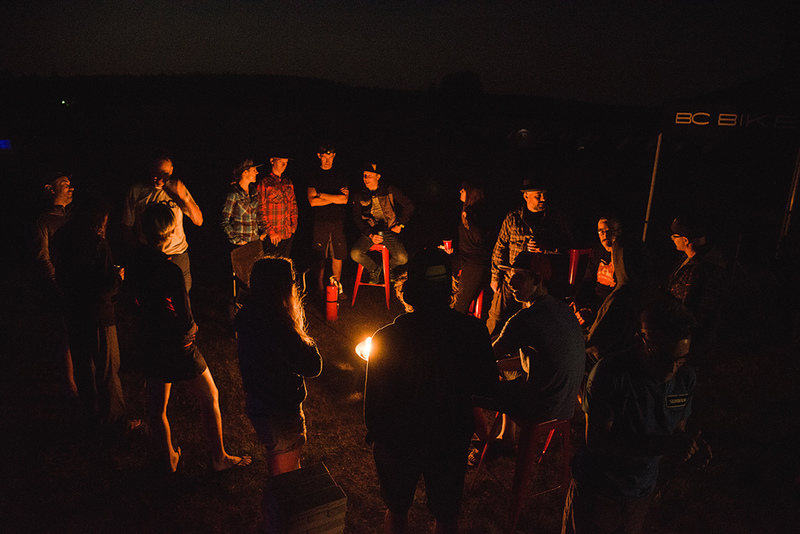 And in the evenings, we would all sit together and talk about the day’s exploits. 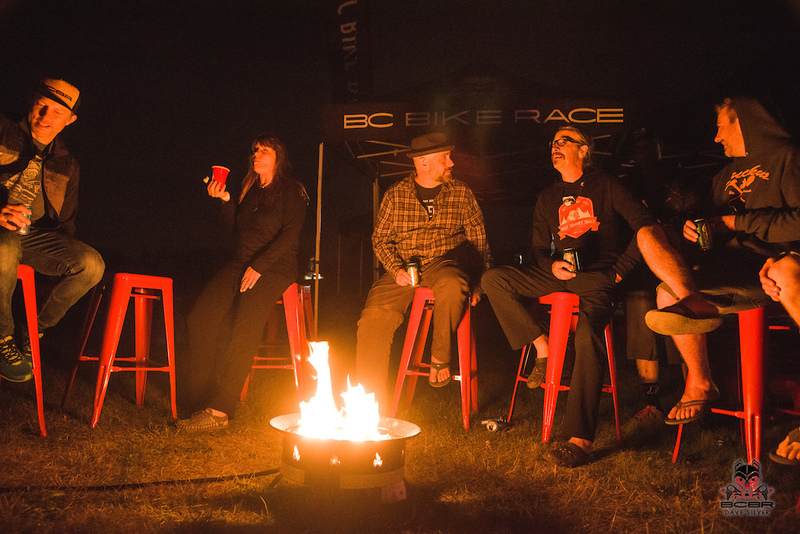 I can’t wait for my next adventure with the boys and girls from BCBR in the North of Canada! Awesome story, great photos... had such a good time. Huge thanks to Dean, Dre and the crew for inviting me to come along. Experience of a lifetime for sure. Looking forward to riding with you and Dan on La Palma in February Julia! 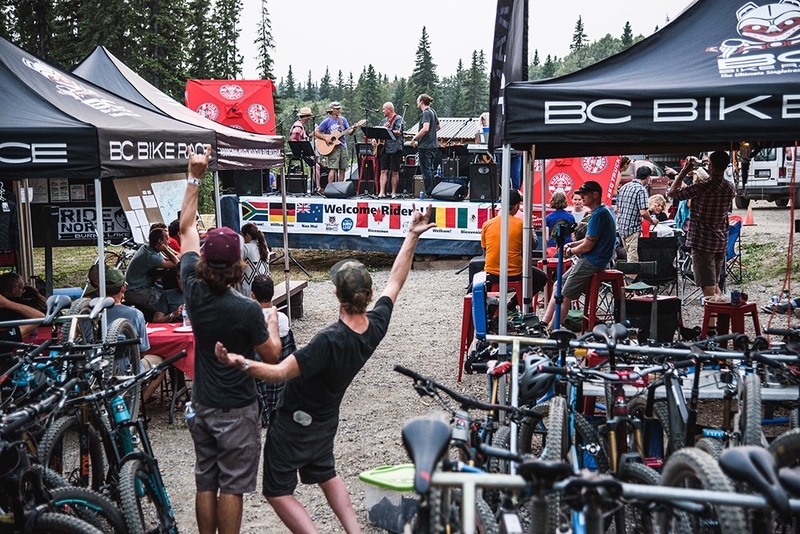 after completing the bcbr race , had three goals for 2019 , trans Provence / transcadia/ bcbr ride north , didn't get into the TP but after reading this am going to northern bc for sure !!! Beers, swimming in the lake, and wildfire smoke... Northern BC AF! I know that lake! I picked 13 leeches off my daughter when she came out lol. Awesome pics and story, and nice Rockys! It’s not the lake to lounge... I’ve swam in it many times over the years and it’s all good, just jump in and get out. Repeat all you want. Lounging around can stir up and attract the little ones. wish i could go do that! It looks like a good time. 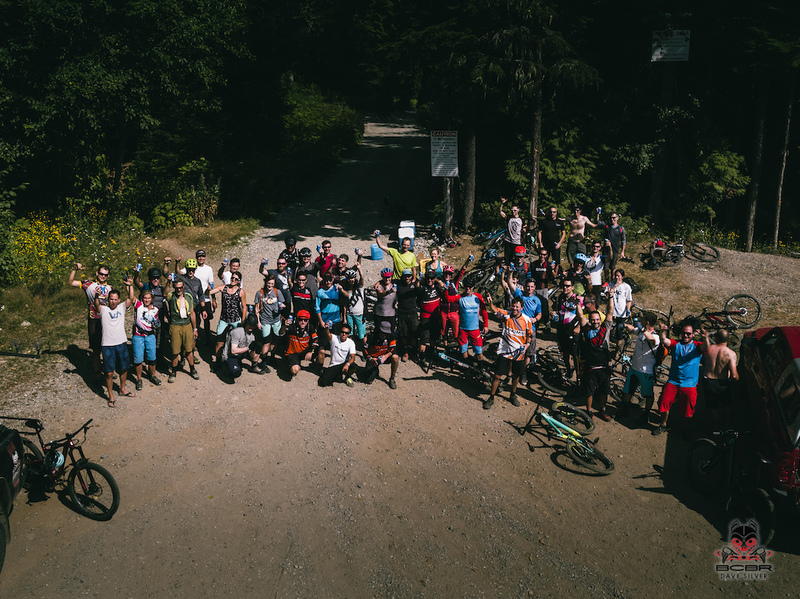 Awesome pics, write up, trails and riding! On the list for next season!